September 29th 2018 - BOCA RATON, FL – Friday and Saturday, September 28th -29th twenty-eight High School teams and seventeen individuals from all across south Florida competed in the 2nd Annual South Florida PGA High School Championship supported by Callaway, Florida Institute of Performance, and Florida Gulf Coast University PGM Program at Boca Grove Golf Club and the Polo Club of Boca Raton. 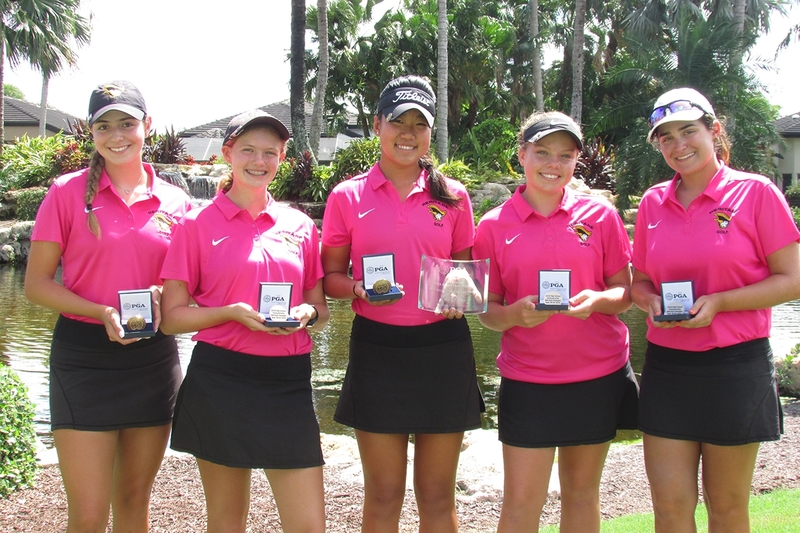 The team of American Heritage Plantation proved to be the strongest girls team in the field today, capturing the overall girls title by shooting an impressive two-day team total of 600. The team was coached by Linda Sibio and was comprised of Alena Lindh (143), Casey Weidenfeld (146), Kelly Shanahan (152), Lily Celentano (159), and Ana Lopez (168). The team of Archbishop McCarthy High School was runner-up shooting a two-day team total of 607. The team was coached by Carl Phillips and was comprised of Taylor Roberts (139), Jennifer Lily (151), Natalia Jimenez (152), Morgan Herring (165), and Rileigh Baker (188). Taylor Roberts representing Archbishop McCarthy High School captured the girls individual championship shooting rounds of 68 and 71 for a two-day total 139. Alena Lindh representing American Heritage Plantation was runner-up in the girls individual championship with a round of 71 and 72 for a two-day total 143. Maisie Filler representing Oxbridge Academy took home third place in the girls individual championship shooting rounds of 74 and 71 for a two-day total 145. The team of Boca Raton High School proved to be the best boys team in the field today, capturing the overall boys title by shooting an impressive two-day team total of 588. The team was coached by Jordan Hernandez and the team was comprised of Frankie Harris (140), Jack Tharrington (147), James Nieporte (147), Nat Sakchawanpob (154), and Carson Parker (159). The team of Oxbridge Academy was runner-up shooting a two day team total of 609. The team was coached by Dan McLellan, PGA and the team was comprised of Tyler Stachkunas (149), Camden Waldt (150), Matt Myers (154), GT Nicklaus (158), and Henry Horgan (161). Griffin Steutel representing Miami Country Day School captured the boys individual championship shooting rounds of 67 and 71 for a two-day total 138. Frankie Harris representing Boca Raton High School was runner-up in the boys individual championship with a round of 69 and 71 for a two-day total 140. Jack Tharrington representing Boca Raton High School took home third place in the boys individual championship shooting rounds of 79 and 68 for a two-day total 147. Scoring method in the team competition was comprised of the four best scores from round one and the four best scores from round two. To view complete results from the girls championship event click here. To view complete results from the boys championship event click here.